Spring has finally come to the upper Midwest, and with its arrival Hongtao Zhou’s installation Snow Furniture is an increasingly distant memory (fig. 1). 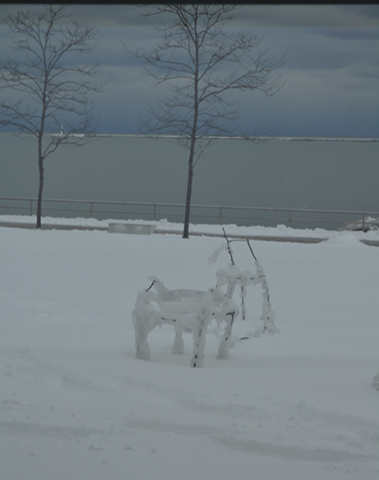 Over three intensive days in late January, Zhou, a woodworker and sculptor based in Madison, Wisconsin, used snow, ice and sticks to create a set of chairs outside the East Galleria of the Milwaukee Art Museum. Part performance piece and part political statement, the installation was one of the more unusual and provocative works in an exhibition of “green furniture” Zhou and I curated at the MAM. 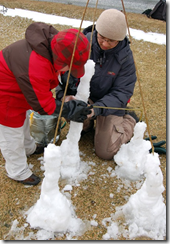 As performance piece, Snow Furniture featured Zhou and a team of local school children (fig. 2). Bundled in down parkas to withstand twenty-degree temperature, these energetic assistants helped create the slushy material used to build the chairs. Zhou equipped them with an aluminium bucket, and sent them to fetch water from the shore of Lake Michigan, a few steps away from the museum. 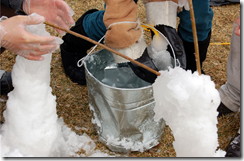 Snow was mixed in with this water, and then applied to an armature of sticks (fig 3). Within minutes, this mixture froze and the chairs took shape to the delight of the children and the audience of adults watching from inside the museum. 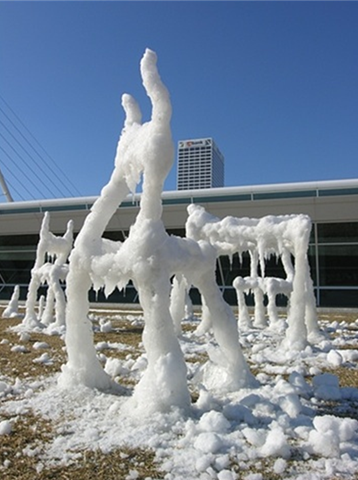 This might seem like an innocuous playground exercise or a variation on a snow sculpture competition, but the political stakes of the installation became evident a few days later, after an unusual early-February thaw. As temperatures rocketed into the high-40s, the chairs started to melt, morph and lose their rigidity (fig 4). They took on a biomorphic, surrealist air. 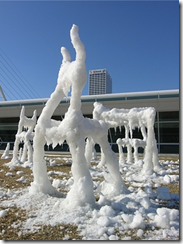 “Dancing furniture” is the way Zhou described the installation when he returned to Milwaukee to enjoy the warmer air. He argued that the change in the shape of chairs called attention to the entropic effects of global warming. For Zhou, the work specifically indexed one of they key manifestations of climate change: increased temperature variation and the shift from steady seasonal patterns to rapid freezes and thaws. 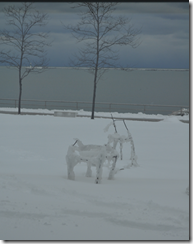 As the winter went on and temperatures continued to vary, the chairs continued to dance. To return to the installation each morning was to see a fresh and reinvented work. One morning in late-February after a snowfall, the chairs looked like fluffy, upholstered divans. After a cold snap in March, they were icy and skeletal (fig 5). These variations tracked something more than the effects of climate change. The constant evolution of Snow Furniture showcased the artistry and animism of nature, the obsessive inventiveness of her masterful hand. Like the artist David Nash, who builds wooden sculptures out of unseasoned wood that changes shape as the material dries and shrinks, the aesthetic power of Snow Furniture hinged on nature’s power and unpredictability, on changing temperatures, wind speeds, and uncertain patterns of rain and snow. What was truly green about the installation was the way it called attention to this power—to nature as agent and artist. Zhou, who is fond of such sagely pronouncements, is a fascinating character with an unusual background for an artist. Born in China, he came to the US in his mid-twenties to do a PhD in furniture engineering at Purdue. In his coursework and dissertation, he focused on the “lifecycle” of furniture. His challenge was to design a chair that would last for a definitive period. The goal was five years. Zhou mastered this challenge but wasn’t fulfilled by it. After he finished his degree, he moved from the factory to the studio to take up an MFA in woodworking under Tom Loeser at the University of Wisconsin, Madison. His focus has been on sustainability and environmentally-friendly furniture. 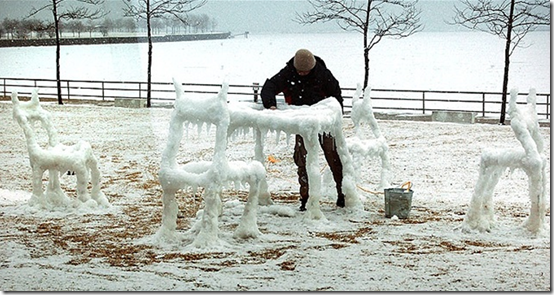 Snow Furniture reflects Zhou’s unusual training. Like any good engineer, he harnessed a force larger than himself to craft the chairs. And like his work at Purdue, he created a set of chairs that only existed for a fixed amount of time. But while Zhou’s earlier designs failed and then endured as a series of parts, the dancing chairs evaporated into thin air, leaving no residue. Gone without a trace and largely crafted by the power of nature, Snow Furniture invites us to reflect on the way we value art, and the premium we place on durability, artisanal skill, and the marks of the artist’s hand. Though his installation no longer presides in front of the museum, Zhou’s other-directed, ephemeral aesthetic raises questions for every artist to think through. See also the website for Hong Tao. We have not had themed issues as yet in Journal of Modern Craft, and this latest edition was certainly not planned under the rubric ‘politics’. Serendipitously, however, much of its content addresses craft’s fortunes under various political structures. Under the conditions of industrialism craft finds it hard to make a niche for itself – whether within a command economy in communist China or in the apparently lush pastures of neo-liberal North America. Small wonder that in early twentieth-century Britain, as studio craft was defining itself as something more individualistic and even more ‘handmade’ than the Arts and Crafts Movement, the hunt was on for viable craft politics. By the time of the 1930s, makers were paying close attention to the Soviet model, in which local councils of workers organized their own production. British craftspeople such as T. S. (Sam) Haile and Michael Cardew were inspired by the rhetoric of figures like the poet Stephen Spender who argued in his Forward From Liberalism (1937) that “the aim of communism is, as Lenin wrote, to create multiformity.” Home-grown movements like guild socialism, social credit and, for Roman Catholics, distributism (based upon the neo-Thomist argument for “just price”) all appeared to offer a place for the small-scale production that was studio craft. That was, and is, one problem – how to find a space for craft within overarching political and economic frameworks. It is of equal interest to reflect on craft’s relationship to differing ideologies. Do craft objects, along with other works of art, offer visual evidence of a specific political moment? Yes and no. While our historical and critical understanding of craft would be greatly diminished if we did not ground it in its ambient ideologies, craft objects (more perhaps than other kinds of art work) can look exactly the same even as they are embraced or co-opted by very different political values. Tradition is the most potent of the political valences of craft, which can embody cultural continuity during times of drastic social transformation. This quality has been exploited by progressive and reactionary regimes alike—a fact often forgotten by advocates who see craft as essentially anti-authoritarian. It is therefore chastening to be reminded, in our review section, of the political history of mingei. This Japanese handcraft revival started as a fringe avant-garde movement, and was subsequently co-opted as a component of Japan’s plans for an imperial ‘Greater East Asia Co-prosperity Sphere,’ only to be reconfigured after the Second World War as part of the visual culture of a peaceful democracy with strong Anglo-American affiliations. Craft’s chameleon-like properties are also seen in Juliet Kinchin’s article about three potters who were trained in Hungary, more or less simultaneously. From that point their careers diverged. Eva Zeisel, the best known of the three, experienced a disastrous foray into the brave new world of Soviet production, only to become one of the friendly faces of American capitalism promoted in the Museum of Modern Art’s Good Design program. Margit Kovács stayed in Hungary and found success producing work that was ideologically correct within that Socialist context. Lili Márkus, however, slipped quietly into obscurity after she came to Britain—where perhaps the Cold War was not so closely fought as to require potters to be its standard bearers. Elsewhere in the journal are further examples of craft’s course being set by the waves of politics. The Yixing potters described by anthropologist Geoffrey Gowlland have successfully adapted their working habits, and their understanding of skill, to the successive circumstances of pre-war, Communist, and now market-driven China. Jonathan Clancy gives us the turn-of-the-century example of Elbert Hubbard, who made the Arts and Crafts Movement safe for capitalist enterprise (or is it vice versa?) through an appeal to the individualistic ethos of Transcendentalism. And Jennifer Mikulay analyzes contemporary performance artist Alison Smith (also discussed by Julia Bryan-Wilson in the previous issue of the JMC), who weaves together political strands from the nineteenth century with those of the present day. In Smith’s work The Donkey, The Jackass, and The Mule, disparate ideological material is assembled in a way that would be incomprehensible, Mikulay argues, without the use of craft to make the associations.